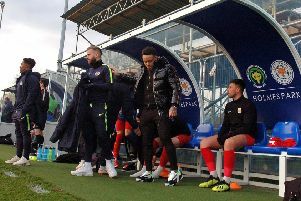 Holwell Sports caretaker boss Ryan Peacock would like a little more consistency as his honeymoon period came to an abrupt end at Dunkirk on Saturday. Peacock and coach Graham Wells had overseen two narrow wins since taking the reins from John Webster, but it was third time unlucky as in-form Dunkirk dished out a 6-0 hammering. “Since I’ve been at Holwell we are either Barcelona or Bangor City, and never really much in between,” Peacock said. “In those few weeks I have seen it all. “We didn’t deserve anything out of the game; we just didn’t turn up. The 100 per cent record the new management team had enjoyed had been built on solid defensive displays, but Peacock was forced to shuffle his side last weekend. Centre-half lynchpin Rob Woodcock was unavailable for the trip, and skipper Aaron Ridout remained on the injury list. And the visitors made the worst possible start when Oliver Clark headed the hosts in front from a corner within two minutes. Keeper Jamie Witham was forced into a couple of saves and Holwell’s makeshift back four had to clear more danger before the rampant home side went 2-0 up after 12 minutes when George Harrison fired in off the post. Sports were given a let-off when the referee overruled his linesman who had flagged for a penalty after an alleged handball on the line by David Hazeldine, but Dunkirk duly made it 3-0 just before half-time through an Ian Bitmead own goal as the centre-half tried to clear Tim Berridge’s header. The game could have been different had Holwell taken their two best chances of the game at the start of the second half. First, Kyle Reek found himself played through, but fired over, and then Joe Hartopp lobbed keeper Mitchell when through, but Rawdon did well to clear off the line. And Dunkirk killed off the game after 64 minutes when Phil Massingham fired under Witham for 4-0 before curling in his second 10 minutes later. Holwell’s miserable afternoon was complete 12 minutes from time when Lang met Robinson’s cross behind the Holwell defence and slotted in. “We have got three of the best centre-halves in the league, but when you’re missing two of them, it would affect any team. “We had to take our best holding midfielder and put him in defence and then change at full-back so we had different partnerships all over the park and it didn’t work out. “I take full responsibility, it was my fault, but you van only work with what you have. Peacock remains confident his side can go into Christmas on a high note, starting with the visit of Radford this weekend. The Nottingham side arrive on a good run of form with four wins in their last five, scoring 14 goals in that period. But the hosts will be boosted by Woodcock’s return, and will also have Tyler Sibson and Luke Underwood back from injury. “I have had good reactions from the players in texts and phone calls after the game. “The chairman and president also texted me telling me to forget about last Saturday and put it down to one of those things. Holwell: J. Witham, D. Reeves, D. Hazeldine, D. Randall, I. Bitmead, B. Smith, A. Fontoura, M. Stevenson, J. Hartopp, K. Reek, L. Chapman. Subs: S. Smith, A. Walker, N. Andrews, A. Wood.